Check out this great deal on jewelry! 1.00 Cttw Diamond Earrings and Pendant 2 Piece Sterling Silver Jewelry Set on Walmart.com. Only $99.88, regularly priced $119.99 + Free Shipping AND Free Store Pickup. Certain to please the woman who enjoys adding shimmer to her style, this diamond pendant and stud earrings set is an elegant choice. Crafted in sleek sterling silver, nestled in a round-shaped frame touched by dazzling 1.00 Cttw Diamonds. A single centerpiece diamond in both, earring and pendant; studded in miracle plate with beautiful shiny diamond accents in a round halo frame to give the piece more beautiful and stylish look. The pendant suspends along an 18.00 inch cable chain that secures with a lobster claw clasp. The coordinating post earrings secure comfortably with friction backs. Polished to a bright shine, this day- or evening-ready ensemble is simply delightful. 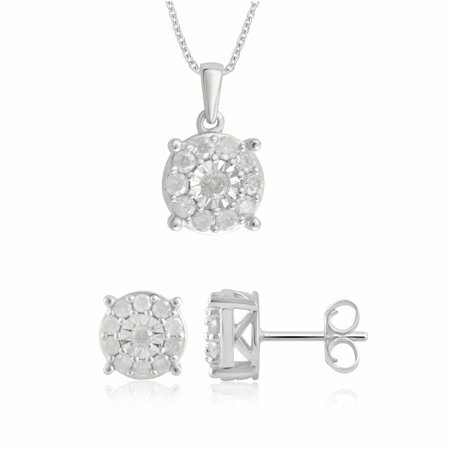 Celebrate any special occasion with this sparkling diamond pendant and stud earrings set. Each coordinating diamond earring features a a beautiful design to your beautiful ear when you wear it. This Diamond jewelry set is a brilliant buffed luster, this pendant and earrings ensemble is sure to be treasured. Diamond quality : I-J/I3, Diamond Cut : Round, Diamond Setting : Prong, Metal : Sterling Silver, Plating : Rhodium. Diamond Carat: 1.00 Carat T.W.